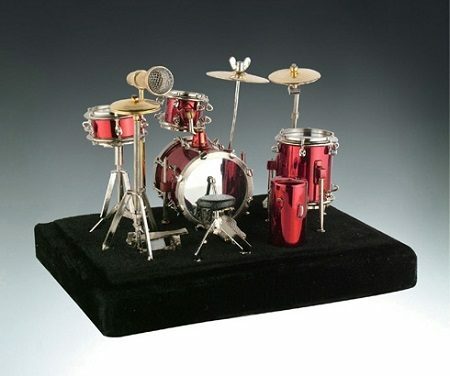 Red Miniature Drumset-The drummer in your life will love their very own miniature drumset. A great, decorative item for the book shelf or dresser or maybe on their desk at work to show off their passion! A perfect music gift any drummer would love! Approximately 5.5″x 4″ x 5″. This beautiful miniature drumkit is firmly mounted to a small base and includes a hard shell gift box that can also be used to store it in. Unique Miniature Drums at DRUM BUM!